“Yeah, I wear sunscreen in my make-up” – unless your make-up is actually an SPF 30+ broad spectrum sunscreen, you are wrong. The sun protection coverage in the pigment of foundation is just not enough to protect you, especially if you are in Australia, even though it might say SPF 15+, trust me, it’s not enough. “I’m just going to reapply, then I’m good for another two hours” – WRONG. So wrong. It is essential to reapply. But here is what most people don’t know… reapplication doesn’t buy you more time in the sun. If you are wearing a 30+, reapplication will help to ensure that you receive 30 times longer than the minimum time it takes for your skin to burn in the sun, over the entire day. Say, if you burn in 5 minutes with no protection, then wearing a 30+ will give you 150 minutes of protection for the entire day – provided you reapply regularly. When that 150 minutes is reached, your skin needs 24 hours rest before going back in the sun, or it will burn. “But I want to TAN… I’m not wearing sunscreen!” – This is a SCARY attitude to have. Anyone in Australia with this attitude is most certainly risking their life with skin cancer. Here’s what you might not know… you can still get colour when wearing sunscreen. The receptors in the skin that signal the melanocytes (this is where our tan colour comes from – the melanocytes darken as a defence mechanism to sun exposure) will still be activated if you are wearing sunscreen. In fact, if you tan with sunscreen on, even though it will be slower, you are much more likely to get an even tan and less pigmentation – as pigmentation is a reaction to an overload of UV exposure. Our skin (especially pale skins) doesn’t cope with such extreme exposure, so it goes frantic creating melanin to defend itself often forming patchy pigmentation and freckles. Also, the physical sight of the bright sun through your eyes will help to send that same signal to your skin to tell it to tan – even if you are wearing sunscreen. But, I only say these things because I know I can’t stop tanners, I will NEVER recommend a tan, it’s just not healthy. “I don’t go in the sun – I work inside all day. I don’t need sunscreen” – sorry to be the bearer or bad news… yes you do. 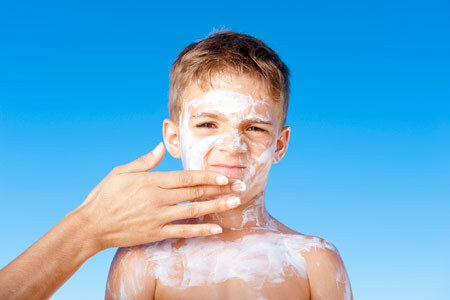 Any amount of sun exposure is remembered by your skin and will build up over time. Even if it’s cloudy, UV is actually still reflecting around, not to mention indoors, too. I can hand-on-heart say that I wear sunscreen every single day – even if I don’t plan on going anywhere. I actually find that it creates a smoother base for my make-up anyway. “I’m allergic to sunscreen” – it would be incredibly rare for somebody to be allergic to every kind of sunscreen. There are two kinds for a start, chemical and physical. It’s just not possible unless you are incredibly unlucky, because the key ingredients in physical and chemical sunscreens are so different and completely unrelated. Sensitive skins usually find that physical blocks (containing titanium dioxide or zinc oxide) will work for them. This is what I use too and after a while getting used to the texture, it like a fantastic, comforting layer on the skin. “I have an SPF 100+ sunscreen… I’m going to lie on Bondi Beach ALL DAY” – No. In fact, put your sunscreen back in your suitcase and DO NOT attempt to apply for the entire time you are in Australia. Our sun is different, it is way more harsh than anywhere in the world (thank you, hole in Ozone layer…), this also means our sunscreens are different. SPF 50+ is the highest in our standard. An SPF 100 from overseas might not even match an Australian SPF 10. Seriously. That’s how harsh our sun is! Buy it when you get here. 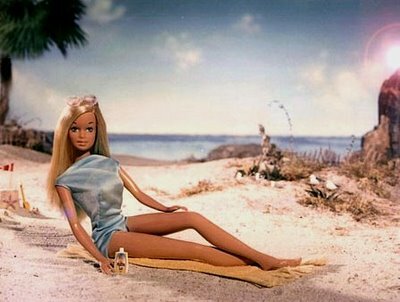 “Ok then, I have an Australian SPF 50… I’m going to lie on Bondi Beach ALL DAY” …please read my article on the new SPF standard before doing so.